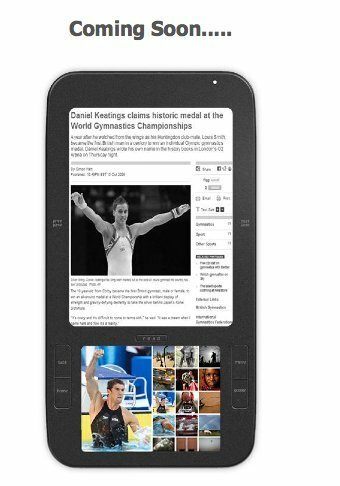 One more e-reader is throwing its hat into the ring: Spring Design has just unveiled its new "Alex" e-reader, a Google Android-based, dual screen e-book reader. Alex comes with full internet browsing over Wi-Fi or mobile networks, a patented dual screen display that combines a 6-inch black-and-white screen with a 3.5-inch color LCD, and a removable memory card for storing e-books. The Alex press release points out a few of the e-reader's additional perks. Users can create their own images and notes and capture them to augment the original text or just dynamically grab relevant content with Link Notes™, Alex's innovative multimedia authoring tool to enhance multimedia publishing. Users can capture and cache web content from their online experience on the LCD screen, and toggle to view it on the EPD screen without taxing the battery life. Spring Design also notes that it's working on content partnerships (we'll keep our eyes peeled): it's "enlisting major content partners, and plans to release the Alex for selected strategic partners by the end of this year." Which e-reader do you want? Or are you sticking with paperbacks for now?